I made dairy free custard for pud tonight and had a sudden craving for something to have with it. I also wanted to encourage my son to eat the custard for the calcium and he does like something sweet. I didn’t have a tremendous desire to bake and initially I was going to make Nia’s Earth bars without the toffee layer (kind of like free from milky ways) but I took a bit of a turn and decided it needed to be pie. Instant gratification pie. 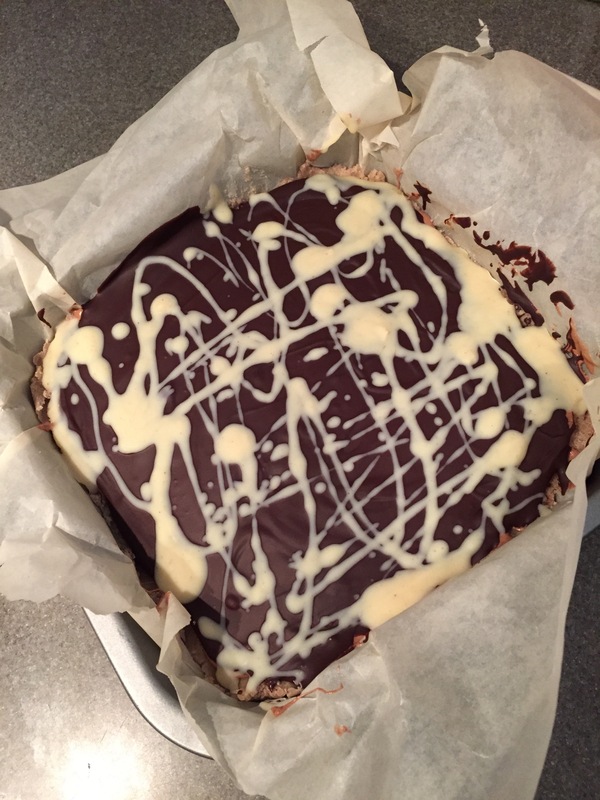 So I made a no bake base layered with Nia’s nougat then melted dairy free dark and white chocolate. It was wicked nice and everyone liked it. It wouldn’t hold up well as a slice but it was ideal in a bowl with custard! loving the lazy pie 🙂 and the choc is dribbled very attractively over the top – though I reckon I would want to skip the custard and stick to the pie!